The Kendo UI Chat widget allows the user to participate in chat sessions with other users or with chat bots. 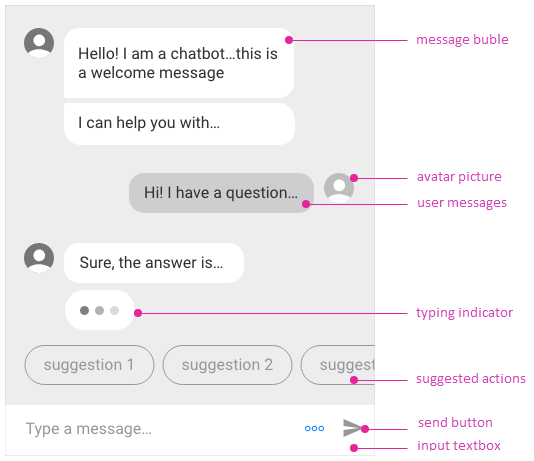 The Chat provides rich conversational experience that goes beyond the natural language understanding and personality of your chatbot. These features allow you to implement conversational UI in your applications by utilizing AI-powered frameworks that work with natural language processing either by following a predefined logical tree or for integrating P2P chat capabilities in the applications. Add an empty div to the HTML. Provide it with an ID. (Optional) Set the width and height of the desired chat inline or by using CSS. Select the div with a jQuery selector. Configure its implementation for the post event. For runnable examples on Kendo UI Chat, refer to the Kendo UI Demos site.